DHS implemented changes affecting asylum seekers Friday, saying in a statement migrants will be waiting in Mexico until the ruling for their merits is handed down. 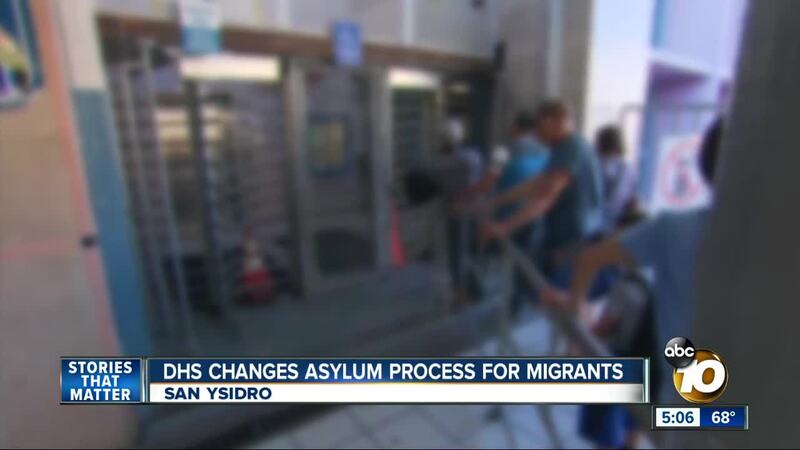 SAN DIEGO (KGTV) - The Department of Homeland Security instituted changes in their asylum process Friday, keeping migrants seeking asylum in Mexico. The department issued a release Thursday saying the changes are due to the high volume of asylum claims with no merit and the high number of migrants who disappeared in the U.S. while waiting for a ruling. The new rule is all migrants who enter the U.S. either through the port of entry or by jumping the wall, are deported back to Mexico whether or not they're seeking asylum. Before this, migrants who passed a credible fear interview would wait in the U.S. while their merit hearing was underway. Immigration Specialist and Lawyer Lilia Velasquez says that could mean years of migrants waiting in Mexico. This causes logistical problems with lawyers who need to confer with their clients over the border. It also stretches supplies and adds to frustrations in Mexico. In the U.S. agencies like the Rapid Response Network were concerned they would be affected by the change, they house migrants seeking asylum, but Velasquez believes asylum seekers here are safe, "no I don't believe they will return those individuals just because logistically it is complicated." Attention focused on the next caravan set to arrive at the border within the month, "I think what they're trying to do is basically tell people don't come," Velasquez said. She believes those desperate and fearful enough won't be dissuaded, "they will never lose hope, that they will let them in, especially if they have children." 10News reached out to DHS to get clarification, an automatic reply read: "All of ICE's public affairs officers are out of office for the duration of the government shutdown. We are unable to respond to media queries during this period because we are prohibited by law from working. If you still require a response, please re-submit your query upon the government re-opening."